Transluminal attenuation gradient (TAG) using 256-slice or 320-slice CT scanners (TAG320) showed a sensitivity of 58–77%, specificity of 44–87%, positive predictive value of 50–83%, negative predictive value of 27–88%, and an area under the curve (AUC) of 0.72–0.78, with invasive fractional flow reserve (FFR) used as the reference standard. 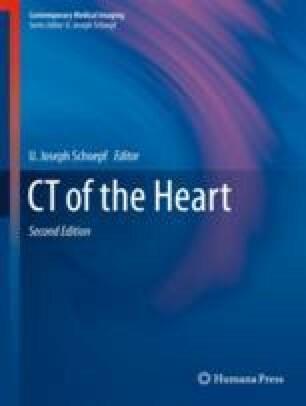 The combination of coronary CT angiography (CCTA) and TAG resulted in an AUC between 0.64 and 0.87. In studies using a 64-slice CT scanner, cutoff values of TAG ranged from −1.8 HU/cm to −15.1 HU/cm, while studies using 256- or 320-slice CT scanners used thresholds between −7.5 HU/cm and −15.4 HU/cm. The addition of TAG to CCTA may improve the diagnostic performance of CCTA for evaluating calcified lesions. The AUC for contrast density difference (CDD) was not significantly higher compared to TAG and visual stenosis assessment. TAG-corrected coronary opacification (CCO) was lower in vessels with a hemodynamically significant lesion; however, TAG-CCO was not significant when subgroup analysis was performed for vessels with ≥50% stenosis on CCTA. The CT-integrated approach resulted in a marked increase in sensitivity and a mild decrease in specificity compared with both CCTA + CT perfusion (CTP) and CCTA + TAG320. CT-FFR provides better diagnostic performance for the detection of lesion-specific ischemia compared to stenosis detection on CCTA and TAG. A significant correlation was found between TAG and transluminal diameter gradient (TDG).